The gold medals and moments of high drama are all very well, but what about the strange little details that have marked out the Rio Olympics? Here are some of the curiosities and lesser-spotted oddities witnessed so far at the Games. Simple lycra is not enough for Team USA. At this tournament, many of the women gymnasts' leotards are adorned with nearly 5,000 Swarovski crystals. "Obviously, sparkles are not an element in the scoring," former Olympic gymnast Samantha Peszek, told the New York Times. "But it's part of the 'look good, feel good, do good' aspect." In the last century, Olympic leotards didn't differ much from the outfit your sister would wear to ballet class. Then the sparkling fad began. In 2008, Nastia Liukin's leotard for the Beijing games had 184 crystals on it. By 2012, Gabby Douglas had 1,188 on hers. Now that figure has nearly quadrupled. "We're in a crystal arms race," Swarovski's Alexander Wellhoefer has said. The cost of those dazzling Team USA outfits? No bombing, no diving, no petting - you wouldn't think Olympians would need to be told all this. Or that Adam Peaty or Simone Manuel might need rescuing. But Brazilian law insists that swimming pools over a certain size are watched over by lifeguards. There are about 75 on duty at the various Olympic centres during swimming, diving, synchronised swimming, water polo and white-water kayaking events. Some 150 lifeguards were also in attendance at the London games in 2012. There isn't really very much for them to do, and onlookers have commented how bored many of them look. You might think they would be pleased to have a prime seat for the games. On the other hand, it's reported they get paid just £260 ($341) for a fortnight's work. At previous Olympics, athletes who made the podium were handed a bouquet of flowers. But for this year's games they have been scrapped, apparently because they are "not very sustainable". It seems most were just tossed in the dustbin. Now, along with their medal, competitors are handed a multi-coloured object with a green base. At first this baffled spectators, and some competitors, such as Chinese swimmer Fu Yuanhui. There was much speculation on social media. Was it a paperweight? A napkin holder? In fact, it's a 3D model of the official Rio Olympics logo, and it reportedly doubles as a medal holder. Although it looks more than capable of weighing down a sheaf of A4 paper as well, if necessary. Olympic glory comes at a cost - if you're American, at any rate. Michael Phelps's five gold medals from Rio, plus his one silver, could cost him up to $55,000 (£42,000) in taxes, it has been estimated. This is mainly because the US Olympic Committee awards prize money to medal winners - $25,000 (£16,000) for gold, $15,000 (£10,000) for silver, and $10,000 (£6,000) for bronze - and this is considered taxable income by the US Internal Revenue Service. Many other countries give medal bonuses - Singapore's Joseph Schooling, it's reported, will get $753,000 (£573,000) for his gold. However, in the US the medals are also given a value and taxed, based on the value of the materials they are made of. According to Forbes magazine, a 500g gold medal from Rio is worth only about $564 (£429), because it is mostly silver, plated with a mere 6g of gold. Silver medals are worth roughly $300 (£228), and bronze medals, which are mostly made of copper, only about $4 (£3). Members of the US Congress have made several efforts to make athletes' medal payments tax-exempt, but as yet to no avail. The British women's cycling team has enjoyed remarkable success, including gold in a thrilling team pursuit. Could this be partly thanks to instructions they received about pubic hair? Some time ago, after a number of riders complained about saddle soreness, British Cycling organised a conference of experts to find a solution. The sages advised tilting the saddles at a slightly different angle and encouraging the athletes to stop waxing or shaving their bikini lines. Pubic hair, it turns out, helps protect against friction and remove sweat from the skin. Issuing these instructions made for some uncomfortable conversations. "It was a tricky one to broach," Phil Burt, British Cycling's long-time physiotherapist, admitted to the Guardian. But it seems to have worked. Burt says the medal-winners haven't had a saddle sore between them for six months. It was not only in Rio's notorious green pool that diving skills earned athletes Olympic glory. Spectators discovered that Superman-style lunges work on the track too - and are permitted by judges. In the women's 400m final, Shaunae Miller threw herself head first across the line, inching ahead of American world champion Allyson Felix. It left Miller with "cuts and bruises, a few burns", but also gold for Bahamas. Joao Vitor de Oliveira qualified for the semi-finals of the 110m hurdles by executing a similar move. This wasn't the first time he'd tried it. "I broke my ribs doing it in China," the Brazilian said. "People tell me not to do it, but it comes from the heart. I put myself first." If a gymnast's coach thinks the judges should have awarded more points, he or she can appeal. But it costs money. Under the rules, accredited coaches on the competition floor have four minutes to lodge an inquiry and submit a $300 (£228) fee. If they submit a challenge on a second event, it's a $500 (£380) fee, and on a third it's $1,000 (£760). The charges are intended to prevent spurious challenges. However, no amount of money will help you in boxing if you think a decision has gone against you unfairly. Under controversial new rules, there are no appeals in this Olympics. BBC boxing expert Steve Bunce believes at least two decisions that would have been appealed against and overturned in previous tournaments were allowed to stand. But Team GB high jumper Robbie Grabarz only had to walk up and talk to someone to successfully appeal against a decision. In one jump, Grabarz rattled the bar, but it initially stayed in place. A couple of seconds later it fell down - but by this time the white flag had been raised to signal a successful jump. The judges ignored the flag and marked the jump as a failure, but reversed their decision when Grabarz protested. Vinicius, the Olympic mascot - who looks a bit like a cat, but is in fact a "a mix of different Brazilian animals" - has made several appearances during wrestling matches. According to USA Wrestling's rule book, coaches can contest a referee's decision by throwing a "soft object". When this happens, the action stops and an appeal jury reviews the video evidence. During previous competitions a foam brick has often been used, but it in Rio it was Vinicius. Stuffed animals have been employed for this purpose before - at the 2014 World Championships in Finland it was a toy bird from Angry Birds. Not everyone is convinced, though, that this use of the Olympic mascot adds to the dignity and prestige of the sport. "I'm still wondering where Vinicius fits in the protocol," Jason Bryant, the announcer for Olympic wrestling at Rio, told Vice. The sight of officials measuring the hosiery of cycling competitors is one of the event's odder spectacles. But under rules introduced in 2012 by the Union Cycliste Internationale, the sport's governing body, socks "must not exceed the mid-distance between the ankle and the knee". This is intended to prevent the use of compression socks, which it's thought can aid recovery and boost performance. At the Rio Olympics, there are 812 gold medals to be won, 812 silver - but 864 bronze. How come? With some sports it's very simple. In doubles badminton, for instance, only one pair can win bronze, so the two semi-finalists face each other in a play-off to decide who gets it. In golf, a play-off is held in the event of a tie. 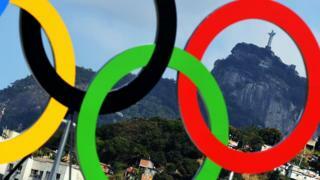 But in some events, such as boxing, judo, taekwondo and wrestling, there are two bronze medals. In some cases, a bronze goes to each eliminated semi-finalist. In others, there's what's called a repechage, where those knocked out by the eventual winners are placed in two separate pools, and compete among themselves for one of two bronzes. Big Macs? Not so much. But surprisingly athletes in Rio have been queuing out of the door to receive free food at a McDonald's outlet in the Olympic Village. And they have been eating with such gusto that staff have had to limit each person to 20 items at any one time. Truth be told, there are few alternatives in the Olympic village. There have been complaints about overcrowding in the main cafeteria, and the nearest watering hole is the inauspiciously named Bin Laden Bar (yes, it's a reference to Osama Bin Laden). But some athletes appear to be aware that burgers won't necessarily up their game. After his exit from the competition, Australian badminton player Sawan Serasinghe posted a photo of himself surrounded by McDonald's offerings, with the caption: "Now it's time to eat some junk food after months of eating clean." As if the games weren't high-pressure enough already, athletes in Rio have to contend with the very real possibility that someone might ask them for their hand in marriage. The first proposal came during week one, when Olympic rugby sevens venue worker Marjorie Enya asked Brazil player Isadora Cerullo to marry her. Later, on the Copacabana, British race walker Tom Bosworth asked boyfriend Harry Dineley if he would do the same. And after winning silver in the triple jump, USA's Will Claye leapt into the crowd and proposed to his girlfriend, Queen Harrison. Team GB's Charlotte Dujardin also received a proposal of sorts. In the stands, her fiance Dean Golding wore a sign that read: "Can we get married now?" After winning gold in the dressage, Dujardin confirmed that she had already said yes. Most controversially, Chinese diver He Zi's boyfriend, fellow diver Qin Kai, proposed to her just after she was awarded her women's 3m springboard silver. It was suggested by some that this was bad form, because it risked taking attention away from Zi's big moment, but others were quick to congratulate the couple. BBC presenter Dan Walker can look forward to wedding bells too, after he was invited to the wedding of the woman who, while out with friends on her hen night, gatecrashed his live Olympics broadcast. Who knew toilet fishing was a thing? Well, apparently it is. And it's one the Olympic authorities are keen to discourage. US basketball player Elena Della Donne posted a photograph of a sign warning of forbidden lavatory activities. One of them (bottom left) shows a stick figure holding a fishing rod. "Guess I won't be toilet fishing today," ran the caption. We asked readers to send us anything strange or puzzling they'd noticed at the 2016 Rio Olympics, and we've attempted to answer any questions. Noel Nelson: I keep seeing these miniature remote controlled trucks moving around on the fields event area in the athletic stadium. What are they used for for? They're used to retrieve objects that are thrown during track and field events. They can carry a javelin and there's a slot in the back into which you can fit a discus. Remote controlled vehicles are a relatively recent addition to the games. When they started out in Beijing in 2008, they were rocket-shaped. In London, they were miniature Mini Coopers. This year, they are small green pickup trucks with the words "Rio 2016" on the side. Samantha: My friend and I were mulling over the dead heat in the swimming. As both got gold, how many "spare" medals must the organisers have cast of each colour, so they are ready "just in case"? The International Olympic Committee does indeed produce spare medals for each games. At the Sochi winter Olympics in 2014 there were 46. After the games were over, the unused spares were taken to the Olympic Museum in Lausanne, Switzerland. Anonymous: The Team GB tracksuits have a zipper which shows previous medal wins and their colours - lovely touch - as confirmed by Matthew Pinsent. Jeff Stevens: In the cycling pursuits, the coaches can be seen with their backs to the track as their team passes behind them. They then take a deliberate step to the left and presumably watch as the team cycle past on the opposite side. Why? BBC Sport's Pete Scrivener replies: "It's to do with how far ahead or behind of schedule the team is. Because you can't really shout to them as they go past, standing a few metres before or after the line is an easy visual aid. If the coach stands on one side, it's a signal to speed up. On the other, it's 'Keep doing what you're doing.'" Mark: When GB won in the men's four rowing, I noticed their oars were set differently to the rest: instead of L,R,L,R they were L,R,R,L. and wondered if this made any difference to their performance? Alex Gregory (pictured left after winning gold) from the men's four replies: "As long as there are two oars on each side it doesn't really matter. But the reason we had it in that configuration is because we, as individuals, were most suited to the particular seats we were in and we each have a preference for whether the oar is on the left or the right. Each seat has a slightly different role and through testing we discovered this was the fastest combination."